AFTER THE SAD,long night when Jesus was captured in the garden, morning came at last, and the news began to spread through the city streets that Jesus, the prophet from Galilee, was now a prisoner. His friends were terrified, while his enemies laughed in wicked glee. And the soldiers led him before the Roman governor, Pilate, for this governor now took the place of the King Herod who had tried to kill Jesus when he was born, in Bethlehem. 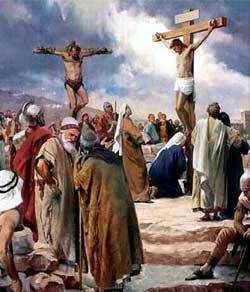 Pilate knew nothing about Jesus. He took him into his judgment-hall and talked a while with him. And he was surprized to hear the wisdom of this one whom the Jews were condemning to die.